Honesty is getting a bad rap these days. Whether it’s auto executives who fidget with emission tests, presidential candidates who manufacture facts, scientists who report fraudulent results as legitimate, or financial gurus who bilk their clients, lately there’s been a disconcerting level of dishonesty. It’s even worse when those who carried out the dishonest acts (or actively supported them) offer a so-called sincere apology, all the while accusing others of responsibility for what transpired. Most articles on the qualities of a successful leader put honesty at or near the top of the list. And there must have been a time (long before my time, I think) when employees could take for granted that their leaders were honest. Employees could listen to their leaders and accept what they heard as the truth. They didn’t second-guess every utterance of their higher-ups. But now, with scandals hitting the headlines on a regular basis, it seems foolhardy to assume honesty among those in charge. As a result, leaders who truly are honest need to work harder to display evidence of their honesty so as to gain the trust of those who look to them. Or maybe we’ve got it all wrong, and we need to accept that good leaders are often good liars. According to Jeffrey Pfeffer, professor of organizational behavior at Stanford University and author of Leadership BS: Fixing Workplaces and Careers One Truth at a Time, some of the most successful business and political leaders have not always been accurate or honest. In this podcast, he cites numerous examples. 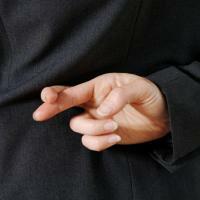 Studies show that by the age of four, 90 percent of children are capable of lying. In fact, according to psychologists, lying is an integral part of healthy brain development and is a key aspect of developing a “theory of mind.” This refers, among other things, to the ability to understand that others have beliefs, desires, and intentions that are different from one's own. Pretty sophisticated, these four-year-olds! The disconcerting reality is that deception is rampant in our everyday lives and people lie all the time. Given this reality, perhaps we shouldn’t be surprised when dishonesty surfaces at the highest levels. Still—and I know this may be naïve—I like to think it’s possible to develop a culture of honesty in the workplace. Doing so is neither easy nor quick. And turning around a culture of dishonesty is not without risk. But it’s worth striving toward, whether or not you’re a leader or have any interest in positions of leadership. In terms of promoting honesty, every individual is a leader.